A few months ago, I received a phone call from the proprietor of this fine web establishment. He informed me that a scene in a movie titled “The Return of Swamp Thing” featured a kid wearing an Auburn shirt, or so it was rumored, and asked if I would be willing to investigate. Why did I receive this phone call? Because, dear readers, I have an affinity for crapola, and because Jeremy probably figured that I had already seen this movie (I had) and that I knew exactly what he was talking about (I did not). But I wanted to. Armed with a link to the entire film on Hulu, I sat down in front of my computer, bucket of metaphorical popcorn in hand, to view the sequel to “Swamp Thing” for the first time as an adult. I eyeballed every frame for a young Auburn fan proudly displaying his colors. Sure enough, not long into the movie, I found a stout, ginger-headed fellow, decked out in an Auburn shirt, loudly complaining about being dragged by his buddy through a swamp in hopes of snapping a $10,0000 shot of Swamp Thing to sell to the National Spectator. I didn’t remember it from the first time I saw the movie. Now, I’ll probably never forget it. I swiftly headed over to IMDB to find the name of our protagonist (never mind that Heather Locklear was given billing over him) and was graced with the name Daniel Emery Taylor (known henceforth as DET). A quick Google search, and I was clicking into what looked to be a personal website, full of interesting tidbits and little-known facts (like that he went to Gwin Elementary in Hoover and, years later, had a bit-role in Road Trip and is currently accepting donations for a new film project that he describes as “‘Friday The 13th’ meets The Biggest Loser” ) about my future friend, DET. I got his email address. I contacted him about a possible interview for TWER. What follows is that interview, conducted via email over the course of two months. TWER: I noticed on your website that you explain why were wearing an Auburn shirt, but could you elaborate a bit? Also, the big question: Are you an Auburn fan? DET: I’m absolutely an Auburn fan! I actually wasn’t much of a football (or sports) fan when I was very little. Bo Jackson is the player that caught my interest, so naturally the Tigers were my team. As I got older, my fandom turned into a great respect and admiration for the university. Auburn, to me, stands as a symbol of integrity and academic excellence, even though it seems they seldom get the respect they deserve. I’m friends with several AU alumni and there’s always something different about them, you know? There’s a class and candor there that isn’t always present in the graduates of other universities. DET: Well, they told me to take my favorite shirts. From there, the wardrobe department began sorting through them. Stuff like my ALF shirt or California Raisins shirt were disqualified for copyright and trademark reasons. That basically left me with my Hawaiian style shirts and my Auburn sweatshirt. There was also this really ugly sweatshirt with no collar they made me wear. I’m not claiming that one. TWER: California Raisins and ALF… those were two good choices. We must be around the same age (I’m 32). I must say that myself and a friend of mine agreed that, in the movie, you look more like a pissed off little man, rather than like a little kid. Exactly how old were you in that movie? And how old was your co-star, the other kid? DET: I was eight, playing a twelve year old. I think Ron Reaco actually was twelve. 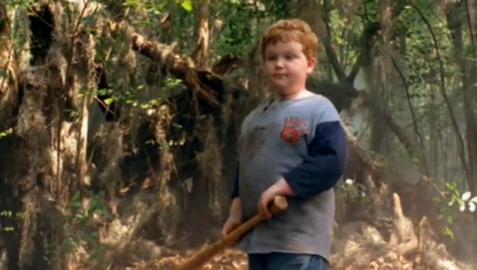 Darryl Hallenbeck as played by Daniel Emery Taylor, age 8. TWER: Speaking of co-stars, did you get to meet Heather Locklear? Or Swamp Thing? DET: Yeah, I had several scenes with Swamp Thing himself. I had one scene with Heather but got to spend a lot of time with her back at the hotel. Heather Locklear and Swamp Thing about to spend some time of their own back at the hotel. TWER: So, getting back to Auburn, do you think Swamp Thing likes football? And if so, do you think he might be an Auburn fan? DET: He comes from the swamp, so he’d probably be an LSU fan. He’s definitely down with the SEC, though. TWER: The Swamp Thing being from the swamp, where was the movie filmed? DET: We filmed it in Savannah, Georgia, even though it takes place in the bayous of Louisiana. TWER: OK, so you bring up the Auburn shirt in the FAQ section of your website. Being as you live in Alabama (Pelham), according to your MySpace profile, exactly how often do you get asked about the Auburn shirt? Do you think that the fact that you are wearing an Auburn shirt has garnered you any extra attention (obviously, that’s how we heard about your role in the movie)? DET: I think it’s definitely garnered me a lot of extra attention here at home. I’ve met several Auburn alumni who said that, during the film’s release, I was something of a cult hero on campus. Unfortunately, the Tigers don’t get a lot of mainstream entertainment attention. TWER: You’ve already said that you’re an Auburn fan – is there a moment that you can pinpoint from your youth that made you an Auburn fan? An epiphany? DET: Hmm … that’s a good question. I think it was more of a gradual thing. Everyone in Alabama feels compelled to make a choice, and I think I was always drawn to how classy and sophisticated the football program and the university alumni always seemed to be. 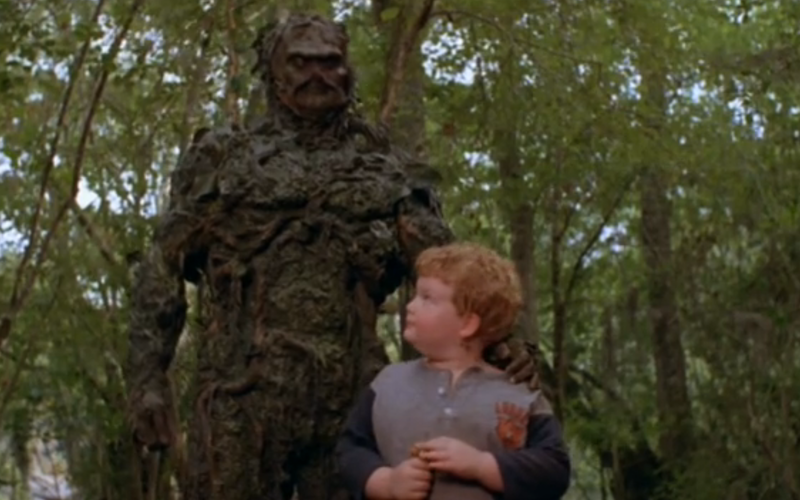 TWER: Last question: Does Bo know Swamp Thing? DET: He would have to. Bo knows everything. If you’re lookin’ to kill time during the dead spot before football, watch DET in action as he and Swamp Thing and Melrose Place band together to stop Dr. Arcane (yes, that really is the bad guy’s name) from doing his nefarious bidness, whatever that is… mutating folks and whatnot. War Eagle. Hey! This is just incredible Mr. Hightower. Great work. Now you need to look into the guy wearing the Auburn t-shirt in the beginning of Cannonball Run. That part was filmed near Atlanta. I am old so my memory might be failing but I really think that there was an Auburn shirt worn by the young character Jude in the 1st Swamp Thing as well. I haven’t seen the movie in 20 or more years so I could be wrong…I will have to see if they have the movie on netflix and investigate. Another good shot of Auburn memorabilia is in the 1984 James Garner movie Tank. In the scene after his son is falsely put in jail he goes in his room to reminisce as he stands in the doorway there is a good shot of an Auburn picture on the wall. The movie was filmed on Ft Benning even though it is called something else in the movie. I am stationed at Ft Benning currently and I live in the next door to the one that belonged to CSM Carey in the movie. Thanks Kody — that was actually one of our firsts! the little boy Daniel in Swamp was really inspired to love Auburn by his 3rd grade teacher (he was in my class when he filmed this movie). I am a huge Auburn fan. I’m sure I was singing praises for Auburn football all fall in class and that inspired him to buy the shirt.